Tiny Cabinet: Do the Thing! There are no breadcrumbs that lead you to Pearlhunter Phin, a Murloc questgiver who inhabits the intertidal zone between Azsuna and Suramar (two of the new quest zones in World of Warcraft's latest expansion, Legion). I only stumbled upon him mucking about in the shallows on my way from one world quest to another—and the completionist I am couldn't resist the bright yellow exclamation mark over his head. "Mrglrg! Mrlglr mrgllrg," Phin said. And then he gesticulated wildly. Though Phin's dialogue might read like gibberish, Phin is technically speaking Nerglish, which is less of a language and more of a prolonged, high-pitched gurgle. "Mrlgrlg glrglmglr mrlglrg," Phin continued. And he looked at me expectantly. Phin's words resist translation, and the quest text offers no clarification. The quest objective read only: ????? So I did what any WoW player would do. I clicked on anything that glowed and slaughtered the surrounding fauna indiscriminately. What you uncover through the quest is a pearl. And through trial and error, you polish it to a shine. 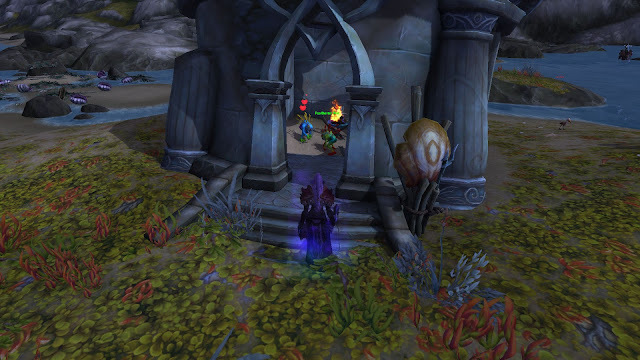 And then, if you're still intrigued, or desperate for mana, or just have nothing better to do, Phin will lead you across the beach and into an ancient Kaldorei ruin, where a family of murlocs await. The Mrglglrm Family. From left to right: Mrgrlilgrl, Mr. Mrglglrm, and Mrs. Mrglglrm. What follows is a conventional story: boy falls in love, the father says no, boy must overcome All Obstacles to get the girl. But part of the delight in Phin's story is the niggling feeling that you know what is going to happen. Though the details are a mystery, the story conforms to our expectations, down to Mr. Mrglglrm's mustache and double-barreled shot gun. And when Mr. Mrglglrm rejects Phin's offer—and you and Phin start digging through the sand on the beach for what, you aren't sure, but this time Phin's instructions are accompanied by a stabbing motion—you might start to worry how the story will end: It will end very badly for Mr. Mrglglrm or it will end very badly for Phin, but in either case, you're sure it won't end happily ever after. Like most modern storytellers, the writers at Blizzard understand that in our heart of hearts we want everyone to die, if just to feel something. Elsewhere on the Broken Isles, a small band of ravenbears convince you to help them perform a ritual (by gesturing and caw ca-cawing at you, which is only a step above Nerglish). At one point, you stand in front of the chieftain and mime his dance, flapping your arms like a chicken and spinning in circles. Then, when the ritual is complete, a dragon is summoned and burns the entire ravenbear tribe to a crisp. If only you had minded your own business, they would still be alive. 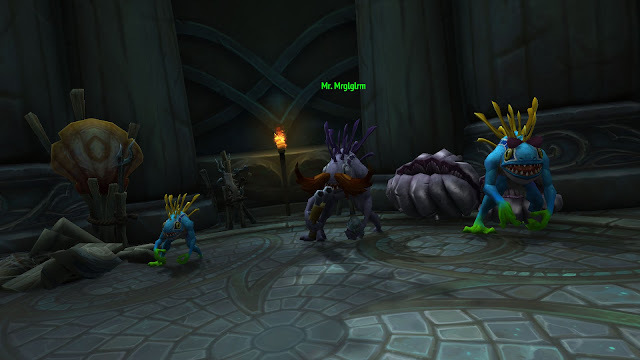 Instead, their smoldering remains will mar that corner of Stormheim forever, forever—forever reminding you of your failings and inadequacies as a Hero of Azeroth. I hate to spoil Phin's story for you, but I must to make my point. While you and Phin are searching for another gift, Mr. Mrglglrm is abducted by neighboring spider monsters, and the two of you rescue him from a web-wrapped cocoon. Upon returning to his family, Mr. Mrglglrm enthusiastically grants Phin his blessing, and Phin and Mrgrlilgrl run off-screen together. They take up residence in a Kaldorei ruin across the way from Mrgrlilgrl's parents, and they stand there eternally gazing into each other's eyes. As one player writes: "I loved, I laughed, I cried. 10/10 story line. True work of art." And that's just it. Time and again, Blizzard's story lines deny you the ending you crave or expect. It's an enjoyable way to spend the time we wait for GRRM to finish his books.